PARIS (Reuters) - Top European fashion houses Louis Vuitton and Hugo Boss (BOSG_p.DE) on Thursday said Christmas trading proved robust, sending a comforting message as the retail industry is hit by the worst downturn in decades. Louis Vuitton, the fashion and leather goods maker which contributes nearly half of profits at the world's biggest luxury group LVMH (LVMH.PA), said business remained solid in the period running up to the end of the year. "On the whole, Christmas trading went rather well. There were no surprises," Louis Vuitton Yves Carcelle told Reuters in an interview after the fashion house's menswear show in Paris. "In the United States, things held up well." Meanwhile, German fashion house Hugo Boss, known for its sharply cut black suits, Mao necklines and luxury accessories, said Christmas trading proved surprisingly good. "Christmas was better than expected, especially in key cities like New York and in Europe," Hugo Boss Chief Executive Claus-Dietrich Lahrs said after a menswear show in Paris. "We feel comfortable with the (2008 sales growth) outlook we gave in October," Lahrs told Reuters. "All this, taken together, is making me cautiously optimistic." LVMH shares closed up 1 percent at 41.92 euros while preferred shares in Hugo Boss rose 2.9 percent to 11.03 euros. Carcelle said Louis Vuitton did well partly because the maker of leather hand bags and fashion apparel stood out from the current avalanche of promotions by never doing sales, not even private ones for selected customers. "Customers are tired to see the sign 'sales' everywhere," Carcelle said. Louis Vuitton's menswear collection for next winter included sober dark blue and light brown suits that marked a clear departure from the flashy mood of some previous years. "The collection focused on elegance and discretion and used materials that were noble but too visibly noble," Antoine Arnault, head of Louis Vuitton communications and son of LVMH Chief Executive Bernard Arnault, told Reuters. The Hugo Boss show on Thursday presented a collection of black jackets and pants, inspired by geometric and architectural lines with some models wearing a pencil-thin straight tie. Having gone through a reorganisation, Lahrs said Hugo Boss was not planning to look for acquisitions and would focus on expanding outside Europe, especially in America and Asia. Lahrs said he aimed to lift the ratio of sales made outside Europe to 50 percent from its current level of 30 percent. "The Hugo Boss brand is still so untapped," he said. Metzingen-based Hugo Boss is controlled by the private equity firm Permira, which has more than 80 percent of the voting rights. Lahrs said it was too early to establish whether Hugo Boss would meet it target of earnings before interest and tax of between 210-220 million euros (196.5-205.8 million pounds) for 2008. He would only say: "We are very positive after what we saw at the end of the year." 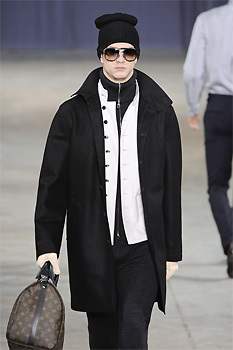 Hugo Boss Belgian-born designer Bruno Pieters said he was not too worried about the current consumer spending downturn. "People still need to invest in new suits," Pieters said. However, many buyers at the shows said they planned to rein in spending this year to avoid being left with unsold stock. Representatives of upmarket U.S. department stores Bloomingdale's and Saks Fith Avenue and the famous Harrods store in London said they also planned to keep their purse strings tight and consider carefully what they would be purchasing. "We going to buy a bit less this year," said Christopher Frye, Bloomingdale's Fashion Director for Men's and Young World. Eric Jennings, Saks Fifth Avenue Vice President and Fashion Director for menswear, said he would be looking for items that had a heritage behind them and gave customers added value. As many customers aimed to spend less, he was keen to find items that were multi-functional or reversible. "I think some designers are going more for discrete luxury like Bottega Veneta, Ermenegildo Zegna and Bruno Cuccinelli," Jennings said.